It's less immersive than the Rift or Vive, but it has titles you'd actually want to play. The PlayStation VR is just what the fledgling virtual reality industry needs today. While the Oculus Rift and HTC Vive made headlines for being the first truly high-end VR headsets on the market, they're held back by their cost, complexity and lack of killer games and experiences. Sony's solution, on the other hand, starts at $400 (assuming you already own the PlayStation Camera and Motion Controllers) and works with the $300 PS4 console that's currently in tens of millions of homes. It's also launching with a slew of titles from major developers, with even more on the way. While the PlayStation VR isn't as technically capable as its competition, it's a much more sensible option. But it's still not quite a must-buy product just yet. Be the first to review the PlayStation VR? The PlayStation VR screams "consumer friendly." Its plastic headset has the same basic shape as its competitors, but it sports a rounder, more toy-like aesthetic. Bright lights on the PS VR make you look like a character in Tron whenever you're wearing it. And instead of relying on ugly and crude straps, it has a sturdy headband with ample cushioning. There's also just one wire coming out of the headset -- an improvement over the HTC Vive's bundle of cables. 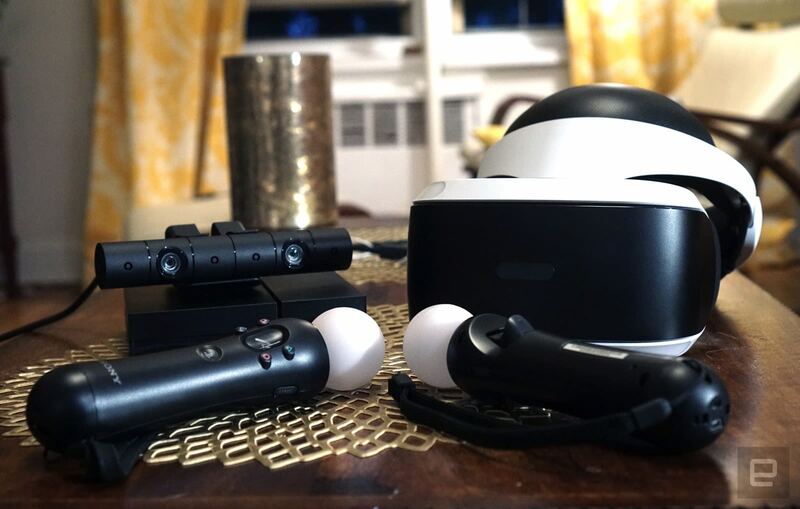 While the Rift and the Vive both feel like advanced prototypes, the PS VR shows attention to detail -- exactly what you'd expect from a company that's been making consumer gadgets for more than 30 years. Moving inside the headset, there's a thin rubbery material around the lenses that rests against your face and nose. That might seem like a precarious method for keeping the headset in place, but the rubbery bits actually feel soft and smooth on your skin. And best of all, it doesn't make you sweat like the foam liners around the Vive and the Rift. Sony's design is far more suited to sharing the headset as well; you just need to wipe down the rubber portions and the head cushion. It's much harder to successfully clean foam liners, and eventually they start to fall apart if you sanitize them well. 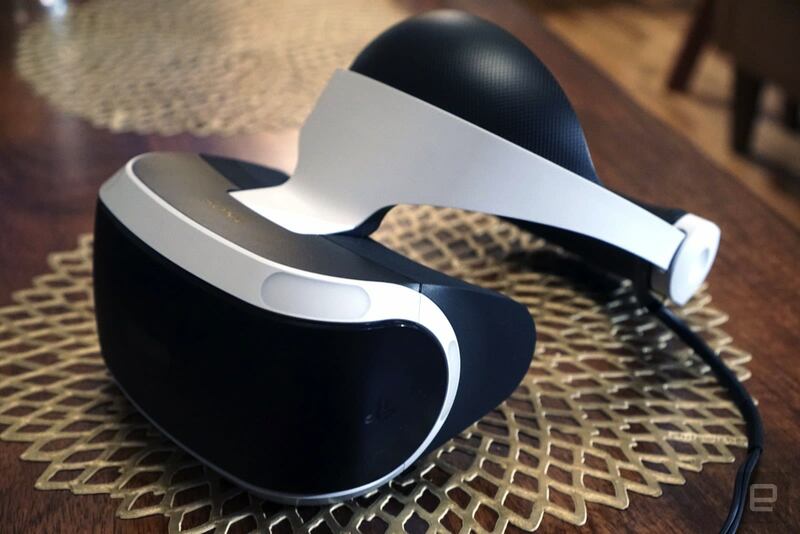 The PS VR's two lenses sit atop a 5.7-inch, 1080p display. That might sound like a lot of pixels, but it's a bit less than the 2,160 x 1,200 resolution offered on the Oculus and HTC headsets. And when you have your face shoved right up against a screen, every single pixel matters. It also provides a smaller field of view compared with the competition: 100 degrees, instead of 110, which has an impact on the overall sense of immersion. The PS VR also includes the same Sixaxis gyroscope found in Sony's game controllers, as well as a built-in microphone. Those lights I mentioned before also help the PlayStation Camera track your head movements, just like how it follows your hand movements with the glowing bulbs on top of the Move controllers. Speaking of those devices, it's important to know that they're required for using the PS VR. You might have assumed they were optional, since they're not included in the $400 Core bundle, but that's really meant for people who already own two Move controllers and a PS Camera. The $500 PS VR bundle includes both (and it's actually a decent deal compared with buying all of the gear separately). I'm not sure if Sony had any idea it would be getting into the VR business back when it debuted the Move controllers in 2009, or even the Camera in 2013, so it's practically a stroke of luck that it already had the hardware available. Those devices were seen as responses to the Nintendo Wii and Microsoft's Kinect camera, and while a few games took advantage of them, developers never really jumped aboard. The PS VR could finally be a way for Sony to sell off its old inventory -- if it succeeds, of course. As for other hardware, the PS VR also comes with a Processor Unit (it honestly looks like an adorable baby PS4) that powers the "Social Screen." That's Sony's fancy name for mirroring whatever you're seeing in your headset to your TV. Some games will also use the TV for multiplayer features, allowing your friends to either join in or play against you on the same console. 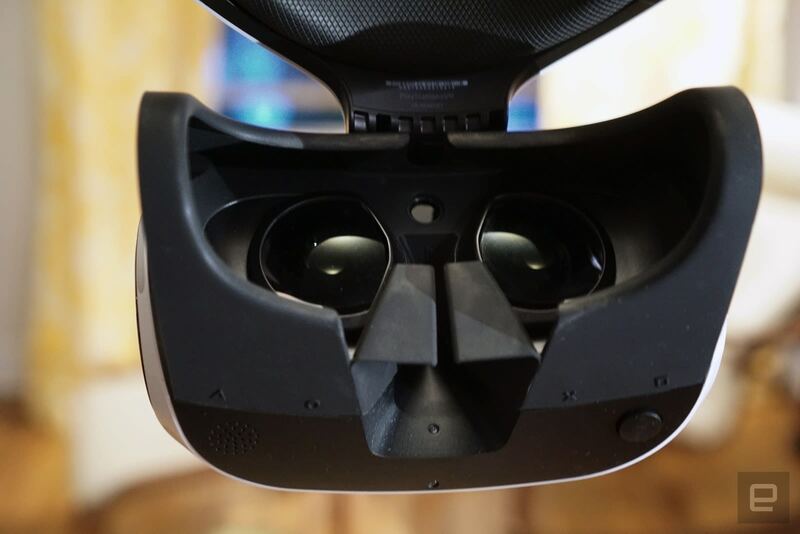 There's a lengthy dongle with an HDMI port and proprietary power/data connection that plugs into the front of the Processor Unit, which is where you actually plug in the VR headset. 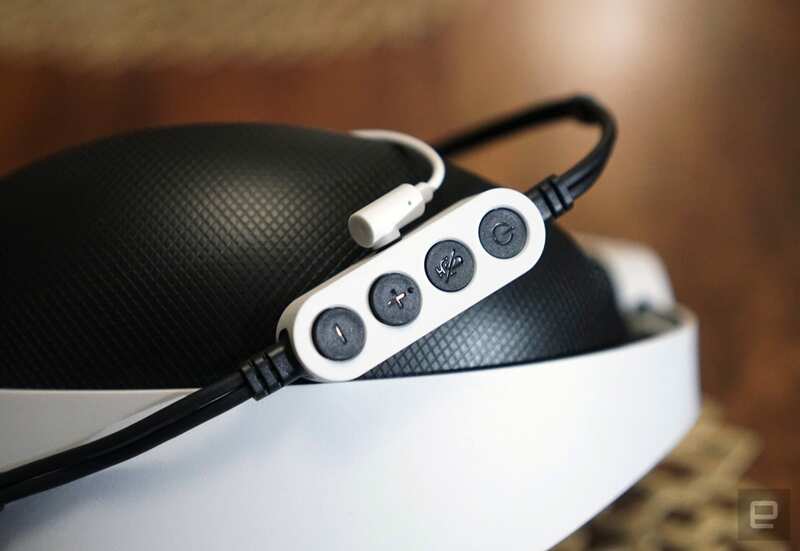 A slim controller box in the headset's cable also lets you turn on the power, mute the microphone, plug in headphones and adjust the volume. If that sounds like a mess of wires, well, you're not wrong. If you want to live with the PS VR, you'll have to learn to deal with plenty of cables. When I'm not using the headset, I disconnect it from the dongle and hide all of the wires. But when you're using it, you've got no choice but to have cables running all around your living room. It's not nearly as cumbersome as the HTC Vive's Alien-like cable bundle, but it's still a potential hazard for tripping or knocking things over on your coffee table. If you're among the many PlayStation owners (myself included) who don't have the Camera or Move controllers, you'll need to allot some setup time for those as well. They're fairly easy to connect, though the Camera's precarious stand always needs some fiddling. The Move Controllers also need to be plugged into your console over USB to get set up, a process that took several tries for me. With everything connected, you just need to hit the power button on the headset's inline remote to turn on the Processor Unit (it comes alive with a satisfying "beep"). 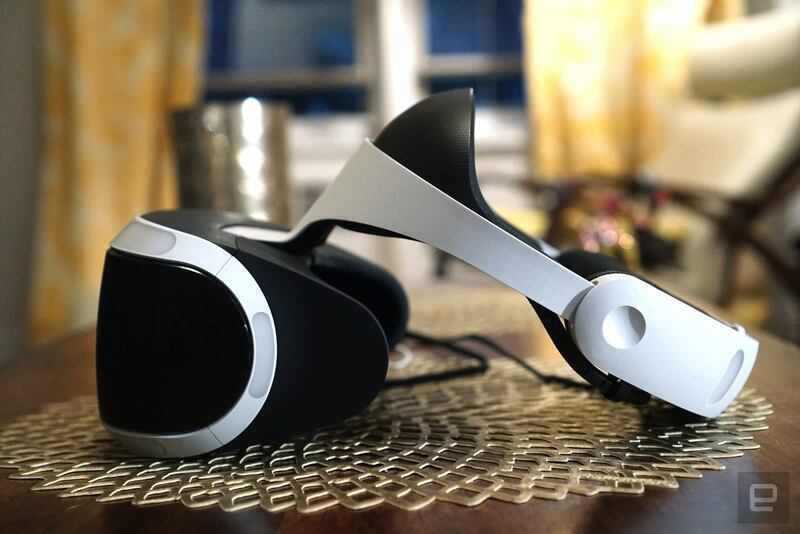 Slipping on the headset -- which involves lengthening the front telescopic portion of the lens, pulling back on the rear of the headband and tightening everything with the adjustment dial -- brings you to the familiar PlayStation 4 interface. Sony didn't make any changes to its PlayStation dashboard for VR, but then again, it didn't really have to. The interface translates well to VR, especially since you're still navigating it with your existing DualShock 4 controller. Eventually it'd be nice to see some virtual reality flourishes while browsing your PS4 library. At this point, you're basically just staring at a 2D screen inside of the headset. From afar, the PS VR's headset looks pretty bulky. And at 1.3 pounds, it's also significantly heavier than the one-pound Oculus Rift and slightly beefier than the 1.2-pound HTC Vive. But here's the thing: Sony's headset doesn't feel heavier when you're wearing it, thanks to the smart ergonomics of the headband. The front of the band rests on your forehead -- it's almost like you're wearing half of a helmet -- while the rear portion sits against the back of your head. Both sides are cushioned well, and the back of the band also has weights to help balance everything. The result: I can wear the PS VR for hours on end with glasses without feeling fatigued, whereas discomfort is a big problem for me with the HTC Vive. It also doesn't make me feel like I'm strapped into some sort of Clockwork Orange eye torture device, a sensation I inevitably feel when using the Rift or Vive for too long. This is something worth stressing: Comfort matters if we want regular consumers to see VR as more than just a fad. Geeks and early adopters are often willing to suffer through wonky designs to experience bleeding-edge tech. But for everyone else, headsets need to be something that's easy to wear. Mobile solutions like Samsung's Gear VR and Google's upcoming Daydream headset emphasize comfort, and since they're not encumbered by wires, they're also much lighter and easier to wear than high-end VR headsets. So how does the PS VR handle virtual reality? Surprisingly well, it turns out. The OLED screens spit out bright, vibrant images, and the combination of the PlayStation Camera and Move controllers allow for some solid motion tracking. (It also puts the PS VR a step above the Rift, which still hasn't launched its motion controllers yet.) There's also some decent 3D positioning audio, even with the bundled Sony headphones. And while most VR experiences don't have the same graphics fidelity as you'd get from a PC -- there are more jaggy edges and fewer details -- they're good enough to make for convincing virtual experiences. I was especially surprised at how well the Move controllers adapted to VR. They're just as comfortable as the Vive's controllers but far less bulky, and they're precise enough to let you maneuver small puzzle pieces or flip a virtual object around to view it from every angle. Not bad for seven-year-old technology. The one big complaint I have is with the PS VR's limited 100-degree field of view. It makes virtual environments feel a bit less immersive and more like you're peering through a pair of binoculars. Most people probably won't notice the issue, but it feels like a distinct step back if you're used to more powerful VR platforms. 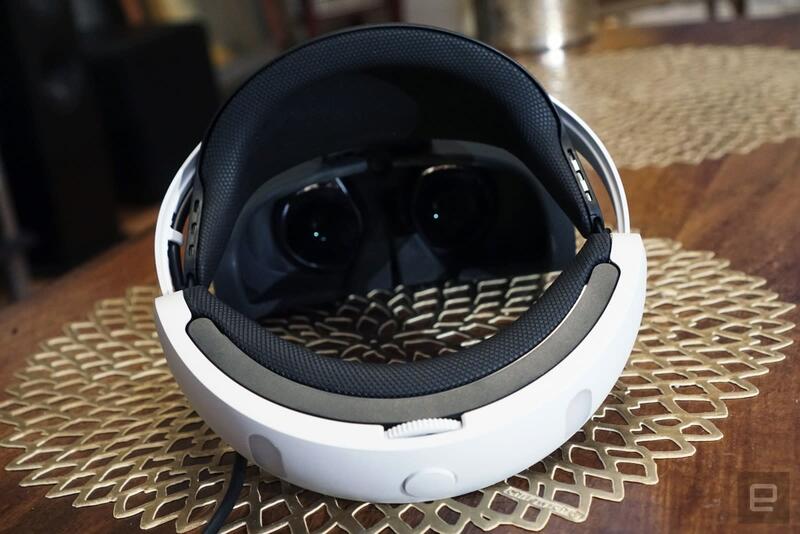 Sony also purposefully designed the headset so that there's a small gap at the bottom of the screen, allowing you to catch glimpses of the real world. I get the safety reasons for doing that, but it's something that could have been addressed with a built-in camera, as on the Vive. So. Many. Games. That's the PlayStation VR's big draw over the competition. While the Rift and the Vive offered a handful of titles at launch, they didn't have much support from major publishers, and there's still a disappointing lack of quality titles on their platforms. The PS VR, on the other hand, is launching with more than 30 titles, with another 20 or so to come by the end of the year, according to Sony. And they're not all just small titles from indie devs either. Every PS VR unit also comes with a demo disc that lets you test out 17 games, including EVE: Valkyrie, Job Simulator and Resident Evil 7. Most of the experiences last just 10 to 15 minutes, but they're enough to help you decide which games you'd actually want to buy. It also gives me flashbacks to the demo disc in the original PlayStation, which I remember playing endlessly, since I didn't actually own many games. Every PS VR owner will also be able to download The Playroom VR for free, which is basically a collection mini-games. And Sony has compiled five of its own experiences into the $40 PlayStation VR Worlds, which will let you do things like take on the role of British gangster or dive into the ocean's depths. Batman: Arkham VR is probably the biggest launch game, because who hasn't secretly wanted to be the Caped Crusader? It comes from Rocksteady Studios, the folks behind the recent trilogy of well-regarded Batman games. With an iconic character and trusted developers, it was the experience I was most looking forward to trying out. And for the most part, it didn't disappoint. We've already covered the early part of Arkham VR in depth, but without revealing spoilers, I can say that it's one of the more unique VR experiences on the market. The game leans heavily on the detective side of Batman, as you're trying to solve a murder mystery. It takes full advantage of the character's gadgets: If you look down, you'll see your utility belt with an environmental scanner on the left, batarangs in the middle and a grappling gun on the right. When you're playing the game, you just need to reach down in the general area to select those gadgets. It wasn't long before I was flinging batarangs on command (and, yes, you're helped out by some heavy aim assistance). You'll come across some familiar faces from the comics, and I was glad to see that Rocksteady brought in its usual voice actors (including Mark Hamill as the Joker) to lend some gravitas to the experience. Arkham VR doesn't have much in the way of combat, though, which will disappoint fans of the developer's previous games. Personally, I too wanted to bust some heads in VR. The game is also only a few hours long (hence the $20 price), so it's more an appetizer than a truly satisfying entree. 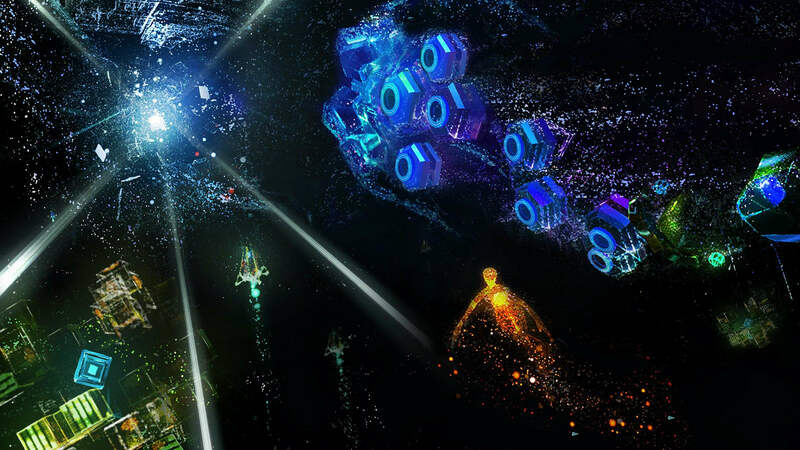 I was also wowed by Rez Infinite, which brings the on-rails shooter mechanics from the classic Dreamcast game into a fully immersive environment. It relies on a Move controller for targeting enemies, but the real beauty of it is simply looking around and feeling enveloped by the stylized graphics and 3D audio. The magic of Rez was always about finding the flow of shooting, which directly affects the rhythm of the score. Infinite evolves that experience in just the right ways. Until Dawn: Rush of Blood is another on-rails experience, except you're literally on rails. The game places you inside a train cart and moves you through a variety of creepy areas, from a haunted mansion to a slaughterhouse with screaming pigs. Naturally, you'll have to shoot some baddies, but it also uses head tracking to force you to duck or lean from deadly obstacles. It's more of a carnival ride than the engrossing narrative experience of the original game, but boy, is it a fun way to show what VR can do. I didn't suffer any of the motion sickness issues that some of Engadget's staff experienced at E3, which were at times so dispiriting that they made us fear for the future of VR. That could be due to developers having had more time to polish their experiences (especially with Resident Evil 7) as well as further refinements with the PS VR software. Either way, I'm glad to see that the PS VR isn't a vomit machine. There weren't any major technical issues either. On some occasions, the PS Camera had trouble accurately positioning the Move controllers, but a reset would usually fix it. That's the sort of bug that Sony can solve with a software update, at least. No surprises here: The PS VR is going head to head with the Oculus Rift and the HTC Vive. But there really isn't much of a contest, if you really think about it. If you value higher-fidelity graphics and are already a PC gamer, it makes more sense to invest in the more powerful hardware. But if you're a console gamer who already owns a PS4, the PS VR makes more sense. When it comes to overall cost and accessibility, the PS VR is a far more compelling option. For now, it's the only way to get into immersive motion-tracking VR for less than $1,000 ($400 for the PS VR core bundle or $500 for the Camera and Move Controller PS VR bundle, plus $300 for the console). The more powerful $400 PlayStation 4 Pro could also solve some of the graphical issues I had with the PS VR when it debuts next month. Even with that machine, you'll still be shelling out less than you would with a powerful gaming PC and the $600 Rift or $800 Vive. Looking ahead, though, I have a feeling the PS VR won't age very gracefully. We'll likely see some more technically impressive PC VR titles next year, and it'll be left in the dust whenever we see follow-up headsets from Oculus and HTC. Microsoft is also opening up its Windows Holographic platform to VR headsets soon, so who knows what that will bring. But here's the thing: Even though the PS VR is a good value for this nascent industry, that's still a lot of money. At this point, most consumers would be better off just waiting for prices to come down across the board in the high-end VR arena. And as great as some of the games are, none of them are true must-play experiences. I had fun with plenty of them, but nothing has pulled me back to play repeatedly as much as recent non-VR titles like Overwatch or Forza Horizon 3. It's also unclear how much Sony will continue to support PS VR moving forward. For now, it's getting buzz for being a low-cost solution. But if Sony doesn't sell enough units, or if developers start to cool on the platform, you'll be left with an unsupported and expensive experiment. In many ways, the PS VR reminds me of the Sega CD, an expensive peripheral that gave us a glimpse at the future but was too expensive and technically limited to truly succeed. The best thing about the PS VR: Even if it's not for you, it could help grow the overall VR market. Since it's not just limited to the Rift and the Vive now, more developers might actually consider making VR games. Good on Sony for actually delivering a decent VR headset that comes in much cheaper than the competition. It's even more impressive that it managed to get a fair number of developers on board for the initial push. Nonetheless, the PS VR is hard to recommend for most people. Even if you're intrigued by virtual reality, it's worth waiting for prices to go down and for the overall market to settle.